The New York Times has made subtle changes to the structure of their leadership in response to the growing number of online readers and, inversely, their decreasing print readership. In May, The Times terminated the public editor position as the newspaper seeks to shift more of their resources and attention toward online feedback and comments. Most newspaper publications have made similar changes, and The Washington Post had also ended the public editor position in 2013. The 2020 Group, a team of seven Times journalists who evaluated the future of The Times and print journalism as a whole, summarized their future plans in a recent report. The report,“Journalism That Stands Apart,” revealed the trend that advertising can no longer support newspapers as much as they did in the past. It’s much cheaper to purchase advertising space on the Internet as opposed to on a physical form. Digital subscriptions have therefore become the backbone of most newspaper publications nowadays. 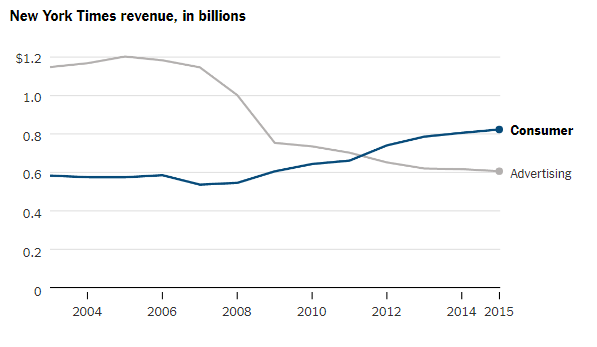 The Washington Post has proved the method can be lucrative.Despite being a privately traded company, The Post has alluded that digital subscription revenue has reached nine figures. The report also concluded that the application of print-based goals aided the newspaper recession. When online news was treated as a pageview race rather than a strategy to drive more subscriptions, this lead to the decrease of print circulation because readers realized they could get the same articles online for free. The newsroom needs a clearer understanding that pageviews, while a meaningful yardstick, do not equal success. To repeat, The Times is a subscription-first business; it is not trying to maximize pageviews. The move into the digital era hasn’t been exclusive to nationwide newspapers. Local publications have also begun to support their own CMS sites as well as third-party e-Editions. The latter are digital replicas of the print product, built from PDFs and turned into an interactive format that lives on the newspaper’s website. Dirxion allows customers to lock their e-Editions behind a subscription login, allowing only subscribers to access the print pages. The e-Edition navigation features, such as custom table of contents, thumbnail page images and cross-reference linking, ensure that the e-Editions are easy to read and use. Print and Internet yellow pages still receive significant usage in U.S.
About 22 percent of Internet users in the U.S. used an online version of a printed yellow pages service in the past month, according to a 2017 study conducted on behalf of Local Search Association (LSA). The amount hadn’t fluctuated since the survey was also conducted in 2015, when 23 percent of U.S. Internet users fell into that category. Internet yellow pages (IYP), such as Dirxion’s Local Search, accounted for 27 percent of the respondents in 2016 and 28 percent in 2015. The adoption of the Internet format helps explain why yellow pages have remained popular sources of information for some consumers and have allowed some publishers to remain profitable. According to an article published by Thumbtack, 68 percent of Americans have a yellow pages directory in their home, something the article credits to the success of some publishers releasing digital versions of yellow pages. 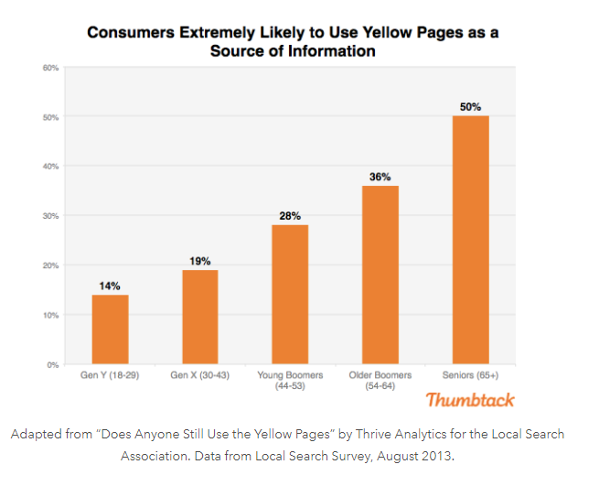 An aging population means the demographics for yellow pages users has shifted as well.A 2013 Thrive Analytics report discovered 50 percent of seniors (ages 65+) are extremely likely to use yellow pages as a source of information as opposed to 14 percent with members of Generation Y (ages 18-29). The types of consumers who have continued to use print yellow pages are classified as “laggards,” those who prefer to use less modern technology due to skepticism or force of habit. A growing senior population will continue to help directory companies. Physical directories are also used in more rural areas where Internet access is either slower or harder to access than in more densely populated areas. People have also gone to yellow pages depending on their needs. Even more tech-savvy individuals turn to yellow pages for their local needs. The LSA found that even though search engines had the market for services such as hotels and restaurants, an equal number of users use print yellow pages to find plumbers, electricians and roofers. Dirxion offers print yellow pages services with flip-and-feel online versions as well as an Internet yellow pages product called Local Search. Online versions of the print yellow pages use PDFs of the publication and are easy to navigate while providing flexibility to print and distribution costs. With the Local Search product, Dirxion creates and provides a website for local directories to sell space on that website to local businesses to advertise on. SEO strategies can be implemented on the sites, pushing the Local Search engine up higher when customers search for products or businesses advertised on the site. Product and information videos are becoming an online marketing mainstay. The video boosts interaction between your business and customers. According to Haymarket, consumers are 64 percent more likely to buy a product after viewing a video about it. 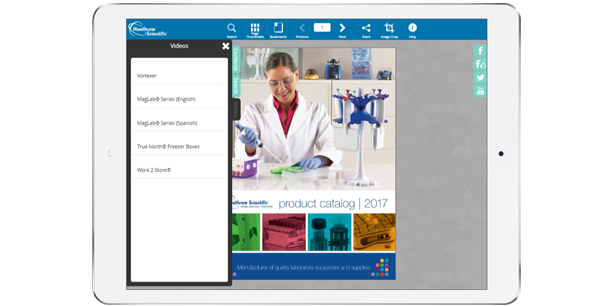 We are following the growth of video marketing to ensure our customers have the best options available when adding video content throughout their online catalogs. If you are embedding videos on the catalog pages, we’ve created a clean play button. When multiple videos are added, however, the products can suddenly find themselves taking a back seat to all of the video play buttons. This presents a visual conflict with your catalog layout. In addition to featuring videos, Dirxion can provide a source for your video creation needs. Our partner in this area has provided some examples here: http://www.previewmyvideo.com/demos/Dirxion. Adding videos gives you a great opportunity to increase revenue or simply create more value for your advertisers.